IMG_2765.JPG, originally uploaded by arahbahn. I made some “Tropical Muffins” this morning. 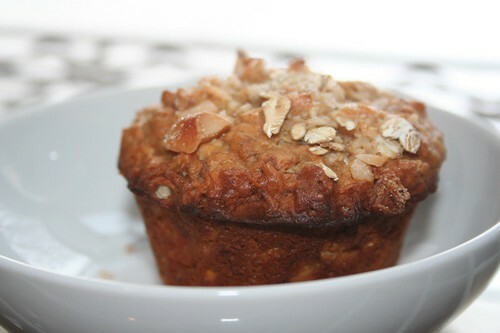 I just had to try a muffin recipe that contained coconut, pineapple AND macadamia nuts! They’re pretty tasty -I’ve had two- but had to bake for over twice the time indicated in the recipe, and still were just a bit gooey on the inside and a little overbrowned on the outside. It’s funny, how crushed pineapple and mashed bananas can add moisture to a mix! We’re in a post-blizzard deep freeze. Which is far better than a deep freeze with no snow, as far as I’m concerned: it’s a beautiful winter wonderland, out there. And yet it’s too cold for any outside activity that takes me beyond the property (I did shovel snow for nearly an hour, last night). My winter running plans will have to wait til later on this week. Off to the climbing gym!